HDCP (High-bandwidth Digital Content Protection) has been developed by Intel to prevent copying of digital audio and video content as it travels across connections such as DisplayPort (DP), DVI, and HDMI. It’s used to protect contents’ creator work, but unfortunately in many cases it also breaks the experience of paying customer for example when they try to watch protected content of on hardware that’s not compliant, or only compliant with an older version of the standard. The latest version is HDCP 2.2 and target 4K content protection, but many 4K UHD TV sets sold in the last few years are not compatible, which means that some cases you may not be able to watch content. 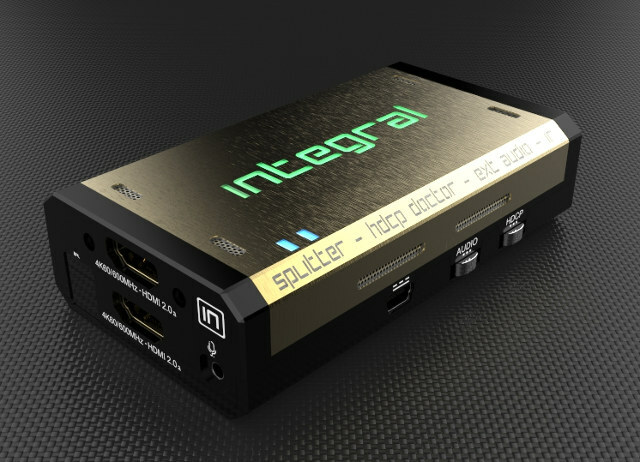 HDfury claims to have the solution with their Integral 4K60 HDMI splitter. Support for inter-device control between both inputs and the primary output (TOP) HDMI channel. HDMI Booster/Extender – Capable of extending 1080p resolution up to 15m. in and 15m. out (30m. total for 1080p), UHD resolution up to 10m. HDMI Doctor – Solves most HDMI integration issues such as HDCP, EDID, HPD, and audio breakout. HDMI Equalevel – Precise signal equalization towards both input and output signals perfectly delivers the best possible picture quality. Hot-Plug control – Force the input device to always see an active connection. Licensing – Licensed and compatible with all HDMI and HDCP technologies. 3D Ready – Capability to pass 3D stereoscopic signal formats. Beside fixing HDCP issues, the device can also be used to display one 4K video source to two 4K TVs or monitors, extra audio from the HDMI signal and output it to S/PDIF or stereo jack output, be controlled via Bluetooth with an Android or iOS mobile device, and more. One of the feature is conversion between 2160p 4:4:4: to 2160p 4:2:0, which would have solution the HDMI 2.0 issue I had with my LG UHD TV (limited to 4:2:0 colorspace) and Rockchip RK3288 boxes with an HDMI 2.0 port which only output 2160p @ 60Hz using 4:4:4 colorspace. The USB port can also be used for firmware upgrades. If you go to HDfury Integral 4K60 product page, you’ll find links to some drivers, a user’s guide, the stock firmware, and Android and iOS, but most of these are not working yet. 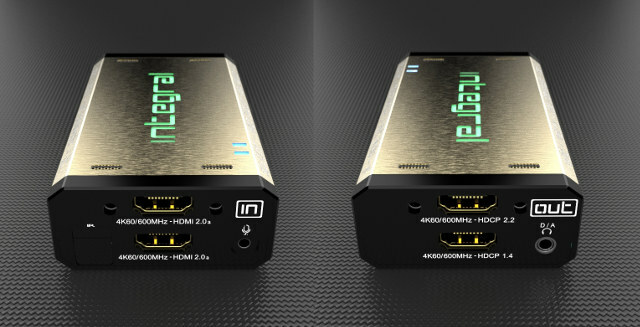 This HDMI 2.0 splitter does not really come cheap at $199, although it goes down to $149.25 with “integral” coupon code for pre-orders to be delivered in October. If you are only using 1080p or lower output, there are existing HDMI splitters that can work around HDCP issues at a fraction of the cost, albeit with less features (e.g. no audio extraction). I bought a Nvidia shield and guess what i cannot shoot out a 4K60 signal that work with my 4K TV from 2014 !!! Apparently the Nvidia Shield shoot out 4K60 at 4:4:4 18Gbps and it’s HDCP2.2 protected. while my TV doesn’t support HDCP2.2 and only accept 4K60 at 4:2:0 … !! Since hdfury guys already have a solution underway, they will get my $ as i won’t buy a new TV ! and i’ll also stop financing the hollywood mafia and their next copy protection that will just annoy everyone and make things that are supposed to work together simply not work together, hdcp is crap ! The public is the one already paying for this stuff to be created and continuing to be licensed. I second Chris’ frustration with HDMI 2.0 – the HPH TV box I use can do [email protected] however your TV must also be capable of 4:4:4. New LG TVs can do this by turning on the “HDMI deep color” setting. I am looking to have two digital cable boxes display on two tv’s using HDMI. One will be the new tv at 2160p and the other is my current 1080p. Is there a way to have picture on both using a splitter like this or what? That device can take two inputs and two outputs, and output one output to two TVs are the same time, but I’m not sure it can handle one output at 1080p and the other at 2160p. Better ask HDFury directly to confirm your setup would work.